Editor’s note: contains detailed explanations of legal practices of euthanasia and eugenics. In the Netherlands it is legal to euthanize children up to the age of 12. There were 22 reported cases between 1997 and 2004, and all cases concerned newborns with spina bifida and hydrocephalus. I have found no clear definition of the term “hopeless and unbearable suffering,” but to me it sounds quite subjective. Thankfully, this is not legal anywhere else. But still, it’s one country too many. When I was born with spina bifida 35 years ago, I was one of about 75 children born with SB that year. Now, that number has dropped to 22. In part, perhaps, due to people eating more folic acid, but that does not explain such a massive drop. Turns out that around 80 of the fetuses with spina bifida are aborted after week 16. In Sweden, we’ve had free abortions since 1975. What this means is that you can have an abortion up to the 18th week of pregnancy. Most abortions are performed during this period. After week 18, the Legal Advisory Council (LAC) of The National Board of Health and Welfare in Sweden (NBHW) has to approve of the abortion and there have to be special reasons. After week 22, no abortions are performed as the child is usually expected to survive, if born. 53 percent of all approved abortions and 46 percent of the total number of cases to the LAC in 2002 were due to the fetus having a disability/illness. For over 35 years, I’ve heard people say: ”If I found out I was expecting a child with Down syndrome/spina bifida/a disability, I’d have an abortion.” In my teens, I used to say that “if I found out the baby we were expecting was NFN*, I’d abort it.” (* NFN = “Normal for now”, i. e., not having a disability). People, also NFN, were usually shocked, some even outraged, by my statement. To them, deciding to abort a ‘normal’ child and welcoming a child that was ‘less than’ was just too foreign a concept. And despite it being illegal, so called ‘mercy killings’ still occur. On March 6, 2012, Elizabeth Hodgins shot and killed her 22-year-old son George, who had autism, before killing herself. Media soon painted a picture of her as the victim – that taking care of her disabled child was so difficult that it was no wonder she let him die, and then killed herself. As if this was not enough, those of us who do make it, or those of us who were not born with our disability, sometimes hear people without disabilities say TO OUR FACE: “If I had/got a disability, I wouldn’t want to live.” Which is, you know, really rude. This also reflects how many people without disabilities see those of us who do have disabilities – as less than, not viable for life. Not a ‘worthy, good life’, anyway. Whatever that is. Still, this is one of the major reasons why we are aborted, ‘euthanized’ – MURDERED. A person who has lived most of their life without a disability but then finds themself living with a disability often becomes depressed. Now, this is understandable. Life changes can be very challenging, and without the right support they can be hard to deal with. This is why getting that right support at the right time is crucial, so that you don’t have to spend a year and a half in the hospital because you can’t get the personal care attendants you need after becoming quadriplegic and end up in a death clinic in Switzerland (where assisted suicide is legal) because you don’t want to live anymore. In Sweden, there was a case last year that ended up in the NBHW where a woman with neurofibromatosis that could not breathe without a ventilator wanted to cease her treatment, i. e. shut the ventilator off. Ceasing treatment is legal in Sweden, but since shutting a ventilator off often means the patient will suffocate and die, there was some debate and confusion whether or not this was, in fact, euthanasia. One could claim that as an adult, it’s up to you to decide what to do with your life. But so many of us never get to make that decision for ourselves, it is made for us, ‘in our best interest’. With the right support, people with disabilities can lead ‘normal’, good lives. We just need to be given that right support. But instead, we are seen as sufferers, burdens, ‘less thans’, whose lives seem so unbearable to the NFN majority that they’d rather see us dead. As a result, the world has been robbed of people like George Hodgins, Tracy Latimer and countless others who never made the headlines. Recently there has been a resurgence of debate of whether or not euthanasia is a viable ethical option for people with disabilities. Proponents of euthanasia stress that since all Americans have the right to life and have the authority of how to end it. They argue that it is better to end their life now instead of waiting until they need palliative care. They also argue that an early death will avoid their family and loved ones from having to pay expensive medical costs to take care of them. This self-centered line of argument goes well with the American value of being self-reliant and the abhorrence of being a burden to taken care of by others. It continues to reinforce the dominant stereotype that a non-able bodied life is not worth living. There are many reasons why this euthanasia debate is ableist in nature. The California Foundation For Independent Living Centers delve into some of the reasons on their website. They state that euthanasia statutes are aimed at eliminating the bureaucratic red tape that prevents terminal ill patients from ending their lives and will also make it easier for people with non-terminal disabilities to argue conditions where they would be justified in taking to take their lives. This type of argument should be avoided at all costs. It promotes the narrative that some disabilities are too difficult to live with and people thus impaired should have suicide as an option at their disposal. This type of argument is insulting and demeaning to people with those disabilities who decide it is better to live with their condition. This narrative has drastic negative consequences. We just have to look at the case of George Hodgins, a young man with autism who was fatally shot by his mother, Elizabeth Hodgins, who then committed suicide. Besides the story being tragic, it provides the example of how the euthanasia narrative leads this mother to do this heinous deed. She most likely thought that the responsibility of taking care of her son sat squarely on her shoulders and did not ask or take the offered support of family, friends, and community members. Too often disability is seen in our culture as a personal issue or something that the intermediate family has to deal with. The devaluing of the lives people with disabilities that euthanasia debate proposes has wider consequences in society. A person with disabilities could be deemed expendable where an able-bodied person would not be. This is evident in the case of Stephon Watts, a fifteen-year-old boy with autism who the police shot to death in front of his home. As in many other instances, the police thought they had a right to murder Stephon even though he only had a butter knife and could not begin to be a threat to the police officers present. The police reaction to the situation illustrates the disregard for life, as they could not resolve the confrontation without murdering the boy. No doubt if Stephon was able-bodied or even a lighter hue, more effort from the police would be given to more peacefully resolve the situation. The history of devaluing people with disabilities influenced by the euthanasia debate gave the police license to use the lethal force they deemed necessary to quell a minor domestic dispute. The lack of amount of coverage this story received from community groups or from the news media even after the national uproar over the tragedy of the similar Trayvon Martin case exemplifies people’s reluctance to validate and protest when people with disabilities are murdered unjustly by individuals or by the state. Euthanasia is used in this culture as an argument for not identifying or accommodating for the lives and struggles of people with disabilities. Society already dismisses people with disabilities as being either the heroic person who achieved to great heights in despite of his or her challenges, the helpless person whose disability causes them to be a drain on society, or the expendable exemplified by the euthanasia debate that basically argues that people with disabilities are better off dead than alive. We in the disability community need to change this narrative and keep illustrating that our diverse and complex lives are worth living. I was fortunate enough to attend vigils for George Hodgins both virtually and in Boston. Each left a lasting impression on me. At the virtual vigil, we were lucky enough to have a video connection to DC. While we weren’t able to see much, we received audio of Ari Ne’eman’s words. The experience was powerful and left me feeling connected to a larger movement, underlining exactly why I was there and energizing me for Boston. Ari’s words, clearly from the heart, were never written down. At the Boston vigil, there was a lot of impassioned, off-the-cuff speaking too. 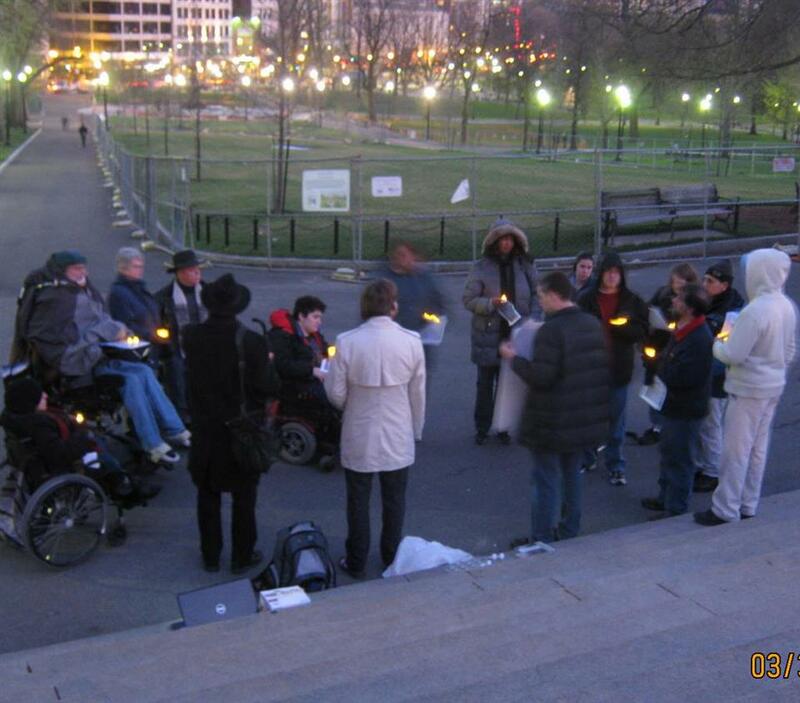 I was ultimately able to see the autistic self-advocacy movement first-hand, from M., who spoke passionately about disability from within her faith community in New England, to “Squid,” who missed the bulk of the virtual vigil but came with the intent of lighting a candle at home and reading the names of four hundred and fifty eight murder victims with disabilities. Thankfully, video will be available from several vigils, including the vigil in DC. When this footage is made available on YouTube, we will bring it to you, so that you can experience what several of us did on the night of Friday, March 30. A crowd of thirty filled Farragut Park in memory of George, a number which we were all proud of. Still more spilled out in virtual space, expressing our fear, sadness and outrage. Through these vigils for George, I realized that we were all handling our fear and sadness to the best of our ability. We came together, over a period of two days in eighteen cities across the United States, to mourn and also connect. I felt this the most strongly when I met the director of Second Thoughts, an organization in Massachusetts fighting the good fight against a “Death with Dignity” act being proposed on the 2012 ballot. I am fortunate to have such a resource close to me and yet also terrified that it is necessary. As our conversation turned to euthanasia and assisted suicide, it was underscored for me that there are people in the world who think it’s perfectly valid to ask us all to disappear, to die with “dignity” and leave the fit, the healthy, and the “normal” in peace. With such a law on the books, I know that my people could easily be coerced and worse, and suddenly these acts would be legal. As I thought about my own challenges in reaching the Boston vigil, from inaccessible streets to a terrible lack of direction, I was heartened that I had made my way. I made several connections which I know will continue to blossom over time, and really, in the face of sheer tragedy, there is nothing more I could ask for. Through this project for George, I have found the community I was desperately seeking, and though we are bruised and battered we are never broken.